After nearly three days of plant-based lifestyle training at Main Street Vegan’s master class and a four-hour meetup in Midtown, last Monday was all mine. A chance to hit my favorite jaunts at my own pace without an agenda. I stayed at a beautiful, reasonably-priced boutique hotel in Midtown, The Mansfield—located steps from the New York Public Library and Bryant Park. Monday morning I woke up with a glow after a fun, four-hour meetup the night before and hopped into the tub. A morning soak is a delightful way to start the day. Before leaving the hotel I sent a thank-you email with photos to the event’s attendees, dropped my bag with the concierge, and headed for a green juice spot. 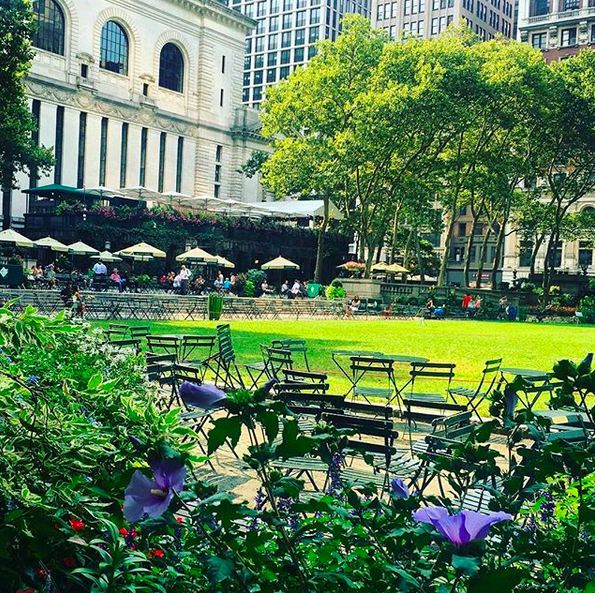 Since Bryant Park was across the street from Joe & the Juice, I got my acai bowl and green juice to go and sat at one of the bistro tables pictured above to enjoy it outside. 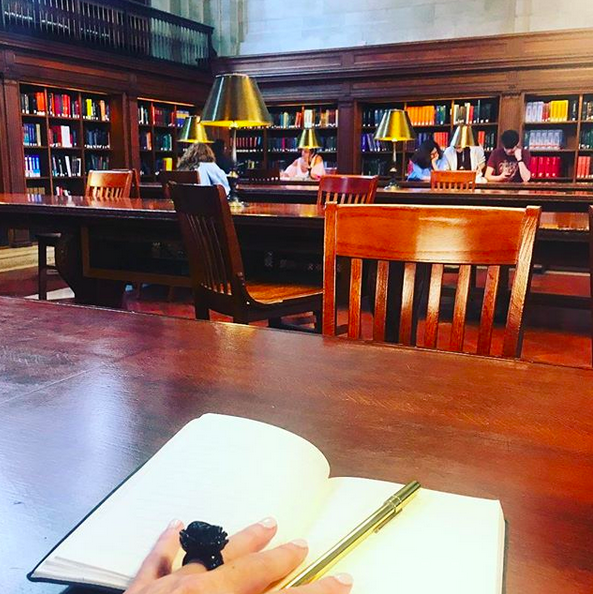 My next stop was New York Public Library to browse their darling gift shop filled with journals, books, and literary-themed bags and to sit in the Rose Reading Room and pen some thoughts. I’d done lots of research to find a beginner ballet class happening on this day and Ballet Academy East had a noon drop-in option. I took the Subway to the Upper East Side, slipped into my pink ballet slippers, and waited outside the studio on a bench with other middle-aged women while the young teens finished their practice inside. A twinge of envy bubbled up, they were so good! The class included a live pianist and a former American Ballet Theater teacher who had lots of patience and broke steps down in helpful language. They included a lot of arm and head movements with the barre practice while I’m still learning the foot placement of the barre exercises. Head and arms add a whole new dimension. I became teary while doing work in the center while practicing a balancing move and during the waltz (I just can’t quite get thse darn steps—especially when we turn while doing it!). After the ballet class, the teacher and another student stopped while I was changing shoes to acknowledge my efforts and offered encouraging words. The fellow student said it took her an entire year to get the waltz. Thank god it’s not just me and I so appreciated their kindness! From there I headed toward Union Square on the Subway to make myself feel better at Peacefood Cafe. 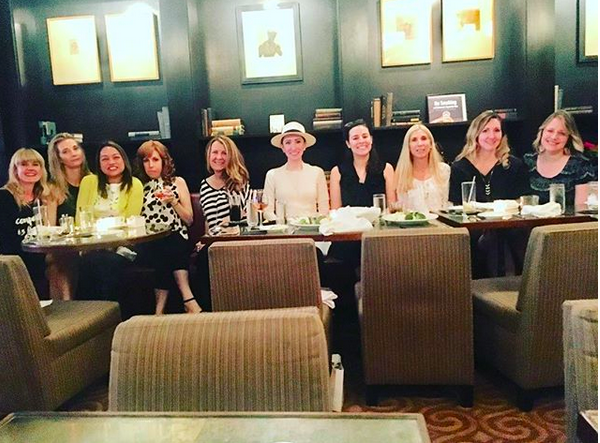 I over-ordered—pizza, tempura veggies, chocolate mousse pie—and loved every minute. Next stop was Strand. 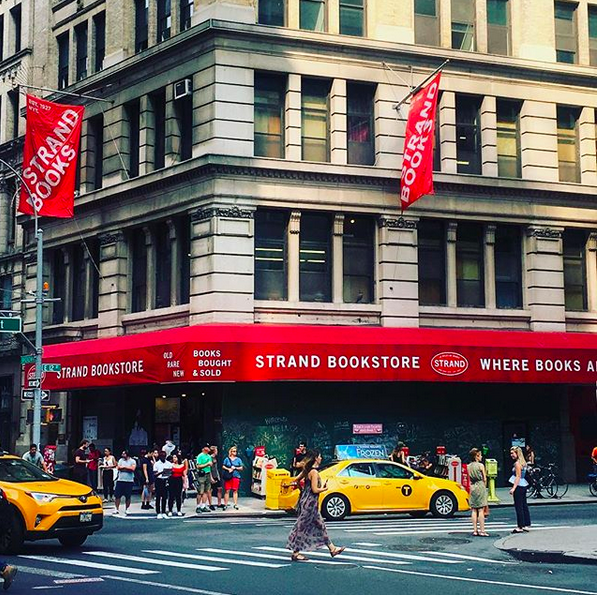 Oh Strand, how I love thee. I came away with a 500-page out-of-print biography on Anaïs Nin. This woman has captured my curiosity since hearing about her and Henry Miller in a Jewel song back in the 1990s. From Union Square I walked to Ace Hotel. Sweaty and out of balance from hauling my laptop on one shoulder all around the city, I sank into a large chair to write in their lobby for an hour or so. I launched Tranquility Salon and began penning a “One Year Later” post about selling the studio while there. The transition to YogaWorks anniversary was last week and the post is still in draft form. Time passed quickly and I realized I could walk to the hotel to grab my bag in 20 minutes, so I might as well keep moving. 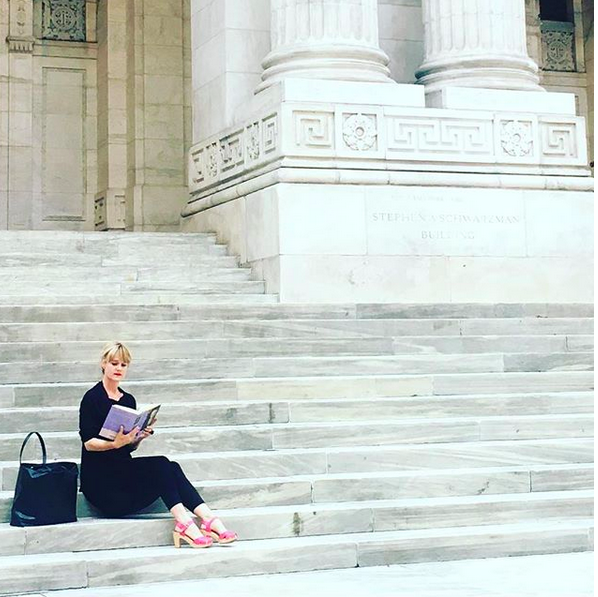 Before hitting the hotel I took a few moments on the steps of New York Public Library to begin reading my new book. This has become my new favorite NYC spot. I grabbed my bag and walked another 25 minutes to Penn Station for a total of 19,000 steps (nearly nine miles)! Rolling a bag through the 7th and 8th avenue crowds near Times Square was no easy feat. I felt like a ping pong bouncing around bodies. On the train home I prepped this month’s Mindfulness module for Year of Tranquility and wrote the final week of the Self-Care module.